he was known as Carl Magnusson (son of Magnus). Sweden and many of the Scandinavian countries originally observed the patronymic system of Names. A patronymic name is a component of a surname based on the given name of one's father, grandfather or an even earlier male ancestor. It was said that at the time of entering the military the men were encourage to take more unusual names. Carl adopted Appel for what reason we do not know. A component of a name based on the name of one's mother or a female ancestor is a matronymic. Eva original name was Samueldattr (daughter of Samuel). The family later adopted Sweensen as its name. Manguson. It was aa accepted practice for men to adopt less common name when entering the military. Eva Sarah Swenson was born February 27, 1815 in Sweden, to parents unknown to us at this time. The place of her birth and youth are also unknown. 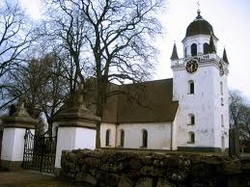 Their marriage is recorded in the Säby, Jonkopings, Sweden church records on the 25th of October in 1830.
were however scores of other who came only to cut wood and having no faith in farming, faded away to other slashing. They were big strapping fellows, chopping wood fall to fall often making four cords per day, drinking, fighting and eating what they liked. 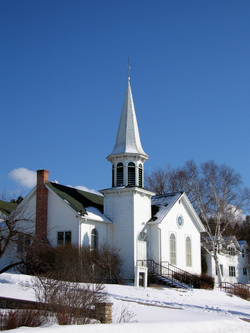 From the From Ephraim/Sister Bay Register 1886-1919 Moravian Church, we know that Eva was the mother of 7 children of which we have records of five. August Appel was born about 1844, Mathilda was born on November 2 1847, John Appel about 1851. Axel Appel on May 27, 1852. Charles Appel was born on January 15 1856. All of the children were born in Sweden. The two additional children were probably born prior to 1844 and did not immigrate to the United States. August Appel, also known as Gust Sander, was born in 1844 in Suby Soken, Sweden. Gust immigrated to America at the age of 27 in August 1871. 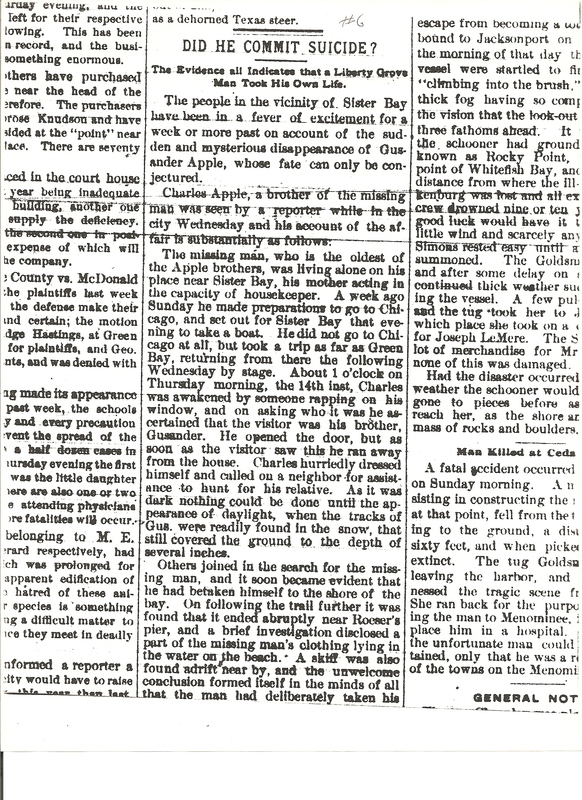 Gust was a logger but bought eighty acres on August 9, 1882, situated in the Town of Liberty for $1200.00. 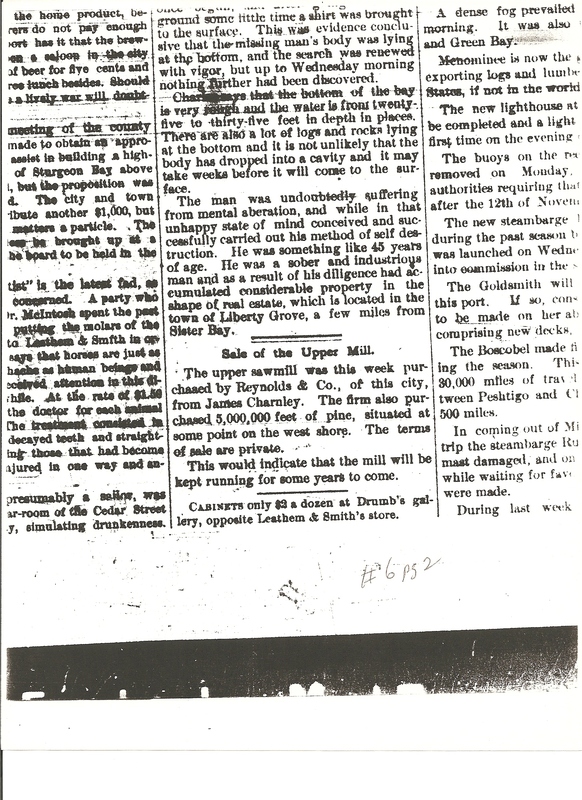 His mother, Eva, was living with Gust when Gust took his life by drowning in November 1889. Gust had a terminal illness and had taken a trip to Green Bay to see a doctor. Once Gust returned to his farm, he anguished with his decision. His brother, Charles, and his wife, Anna, were living across the road. Charles and Anna heard a rapping on the window one night, but dismissed it as a branch hitting the window. That night Gust drowned. Two days later Charles found a note in a bush near the bedroom window from Gust. The note asked Charles to take care of mother. 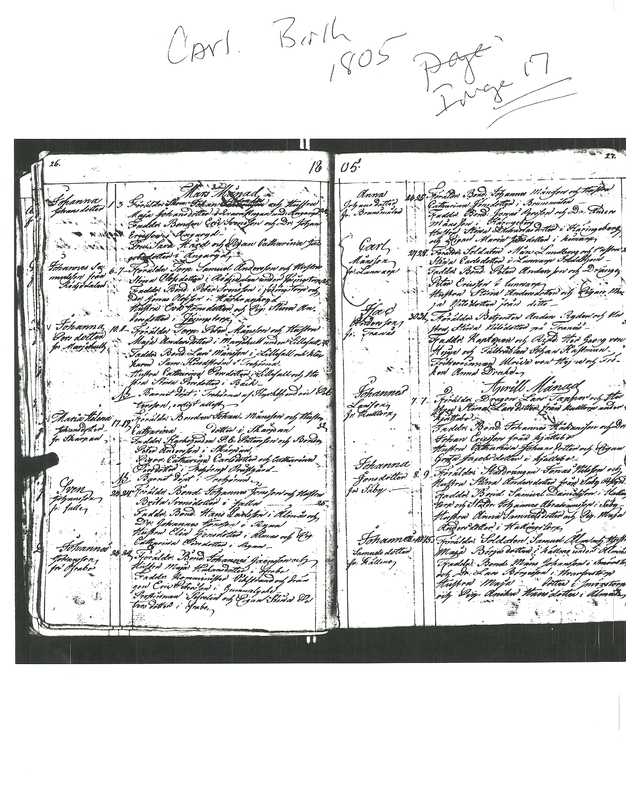 Eva remained in Sweden untill she immigrated to this county in 1881.We do find the record of her immigration in the Emigranten Popular on August 12 1881 She left Goteborg Sweden for Chicago Ill. It notes in the same register that she then located to Sister Bay, living with her daughter Mathilda Peterson. 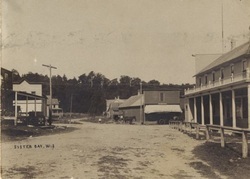 By 1880 Carl has left Door county as he does not appear in the 1880 cencus. It is assumed that in 1880 he had relocated to Chicago, Illinois and it is in Chicago that his death is recorded on January 14 1890. 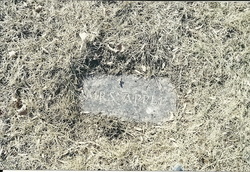 Eva Appel died at the home of her daughter Mathilda Peterson on February 18, 1900 at the age of 83 years, 11 months and 18 days with the primary cause listed as old age. She is buried on February 22, 1900 at the Moravian Cemetery in Sister Bay Wisconsin and her death is recorded in the Door County Registration of Death. Mrs. Eva Sarah Appel born February 27, 1815 in Sweden Europe-Married October 25,1830- Immigrated to USA August 1881- locating at Sister Bay, The mother of 7 Children-of whom four-with the father- preceded the mother to the eternal World.